Leupold recently annouced a new, premium spotting scope with outstanding low-light performance. 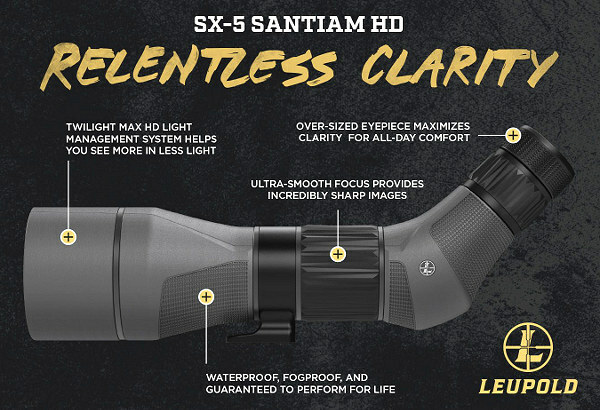 Leupold’s new Santium SX-5 Spotter features a jumbo 80mm objective with a 27-55X zoom eyepiece. The SX-5 is offered in both straight and angled versions. Suggested retail price (including eyepiece) is $2339.00. Best “street price” should be around $1800.00. 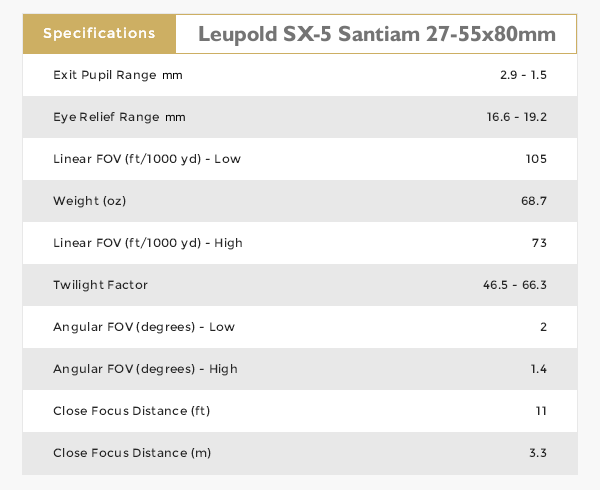 That positions Leupold’s SX-5 above Vortex, Burris, and Pentax price-wise, but the SX-5 is over $1000 less than high-end, 80mm-class Swarovski and Leica spotters which approach $3000 with eyepiece. We’re interested to see how this new Leupold stacks up against the Kowa TSN-880 Prominar spotter ($2450.00 on Amazon) which has been a benchmark in the 80mm class. 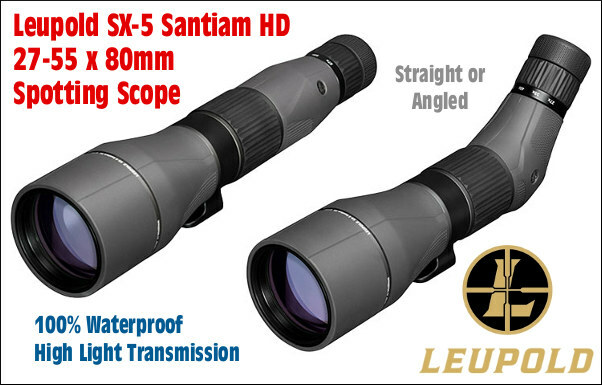 Leupold worked hard to give the SX-5 “second to none” low-light performance. The goal was to create a truly superior optic for hunters who may spend long periods “glassing” for game at dawn and dusk. Share the post "NEW High-Performance 27-55x80mm Leupold Spotting Scope"